Sam Warburton is more used to conducting turnovers than choirs but recently he had to take charge of a rendition of the Welsh national anthem at the Millennium Stadium. 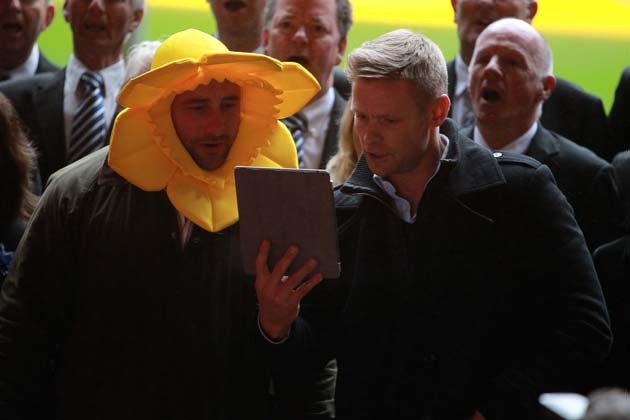 As well as conducting the Cardiff Blues Choir, the Wales captain also had to help David Flatman and Iain Balshaw master the lyrics of Hen Wlad Fy Nhadau (Land of my Fathers). So why did these former England internationals have to learn the Welsh national anthem? It’s all part of BT Sport’s Tour De Flats, with Flatman this year tasked with travelling to the four points of the World Cup – London, Exeter, Cardiff and Newcastle – and completing a challenge at each destination. In Cardiff the challenge was to sing Wales’ anthem and Warburton expalins: “They had a pad in front of them with the Welsh version, which they had no chance of learning, and another version that read phonetically. This weekend it’s back to the rugby, though. Cardiff Blues make the short journey to Rodney Parade on Saturday to take on Newport Gwent Dragons in a lunchtime kick-off in the European Challenge Cup quarter-finals. Watch all the goings-on from Tour De Flats on BT Sport’s Rugby Tonight show on Monday evenings.